At the start of our class on Surface Design class with Michelle Wipplinger of Earthues we each received a bag of primarily mordanted silk to use in the class. This saved us hours of prep work. Many of the pieces were delicate silk scarves. There was also one beautiful cotton shawl. 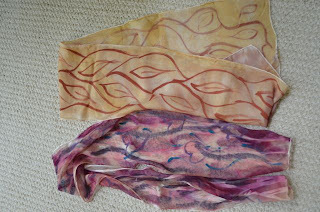 I totally enjoyed exploring the art of dyeing with these fabrics. I played with silk screens, stenciling and resists, including an interesting Japanese tool that created an effect I absolutely loved and that I will write about later this week. 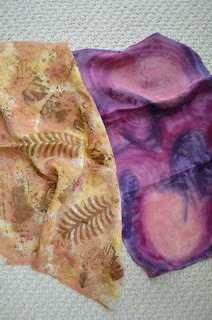 The photo above shows my first two attempts at working with natural dyes. I did some silk screening and painting with sponges on the left lighter color piece. The darker piece was simple painting with natural dyes. These two scarves involved more playing with painting with natural dyes. I also added some effects with pigments to the lower scarf. 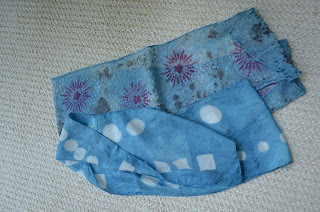 Finally, here are two of my indigo pieces. I will eventually add some additional touches to the bottom one. I learned that I really loved dyeing with indigo. Thanks, Gerrie and Margaret. I am excited about doing more.